HOUSTON, Texas, Jan. 31 (SEND2PRESS NEWSWIRE) — Extraordinary! This is the only word that comes to mind upon seeing Whiteflash’s newly unveiled “Lotus Halo” design from their floral inspired “Lotus Collection” co-created by master craftsman Leon Mege. As if the first Lotus design with its intricate detail reminiscent of a delicate unfolding lotus flower wasn’t enough, Whiteflash has pushed the creative envelope even further by giving customers a visual representation of a design that screams bountiful blessings. Oddly enough, when you hear the terms design and function paired together, your mind usually races to automobiles and the last thing, if ever at all, that comes to mind is a diamond engagement ring. This new setting is a shining example of how demand can dictate design. For today’s woman who leads an increasingly active lifestyle, this lower profile ‘Lotus Halo’ engagement ring is perfection. With a compressed and less pronounced diamond mounting, women can have their apprehension alleviated about wearing their treasure while navigating through their hectic day; whether at home, in the gym, or in the boardroom and beyond. A brilliant interpretation of nature’s infinite beauty, the “Lotus Halo” is definitely not for those looking for your average engagement ring. Sporting a majestic crowning halo of diamonds, this piece is delicate in theory but sturdy in design. The diamond intensive new setting showcases the best of what Whiteflash is known for their superior and critically acclaimed “A CUT ABOVE” ideal cut Hearts and Arrows diamonds. Staying true to the “Lotus Collection’s” take on the elusive lotus flower, the “Halo” resembles a fully bloomed and flowering lotus with layers of fluffy petals cushioning and building up the dramatic presentation of the magnificent center stone. The contrasting 18k yellow gold basket, made up of four diamond encrusted petals, that form the base sit atop an equally elaborate half-pave diamond eternity band. For those non-traditional brides, the “Lotus Halo” can also be customized to reflect your desired gemstone in the center. Even the super traditional Royals and Royals-to-be know that variety is the spice of life and that color in engagement rings are what many of today’s renaissance women crave. Contrary to today’s microwave generation mentality, customers ordering this design have to wait 4 weeks for completion of their ring. This is due to the fact that each and every ring is individually handcrafted by Leon Mege himself and to the exacting quality and craftsmanship that Whiteflash demands ensuring a ring like no other – to last a lifetime. Behind every good design is a creative mind that pushes the boundaries of perfection – that mind, in this case, belongs to both Whiteflash.com founder Debi Wexler and jewelry artisan and design master Leon Mege. Germinating from a simple idea that Wexler had to capture the sheer beauty and romance of the Lotus flower; Leon took this vision and poured the life into it. Perhaps the intricate detail and exacting proportions achieved in “The Lotus Collection” designs can best be explained because Leon learned his old world jewelry technique from old masters working with just a few hand tools. Past winner of the highly coveted AGTA Spectrum Award, the most respected and prestigious award for the design industry, Leon is also a former protege of world renowned couture designer Henry Dunay. A master at the art of micropave, Leon is the go-to-guy for heirloom quality custom pieces. Whiteflash.com is the first company in the U.S. to offer an exclusive brand of Hearts & Arrows diamond and bring the sheer beauty of “super ideal cut” to the Internet Debi Wexler, a computer entrepreneur founded Whiteflash.com in 2000 bringing an expansive selection of loose diamonds to the Internet, including an exclusive brand of Hearts & Arrows diamonds. “Whiteflash A Cut Above”® is unmatched in its brilliance, fire and sparkle and remains the only Hearts & Arrows diamond sold online with advertised standards and a “true patterning” guarantee. 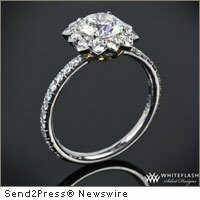 Whiteflash.com also offers original, handcrafted platinum and gold settings, diamond engagement rings and wedding bands, custom designs and specialty jewelry. For more information, log on to www.whiteflash.com or call 877.612.6770. For its achievements Whiteflash.com was named “Lord of the Online Rings” by Kiplinger magazine. It is therefore not surprising that their jewels would be worn proudly by Hollywood glitterati such as Jessica Alba, Keri Russell, Geena Davis and Jessica Simpson. Whiteflash jewelry has appeared on Entertainment Tonight, the Emmys, Screen Actors Guild, MTV and VMA Awards, the Chicago Tribune, New York Post, FOX and FOX-Searchlight promotions.